“The existing cushion rubber was pretty easy to remove, and I decided to leave the end pieces of rubber material attached to the rails rather than trying to cut fresh ones. – Cutting the rubber was pretty difficult, it was a lot harder to cut than I thought it would be. – I tried Stanley knives, craft knives and surgical scalpels, but neither were any good so I ended up using an electric multipurpose tool to cut and shape the cushion profiles – this worked pretty well. – Stretching the cushion cloth over the rubber and rail was tricky as getting it without any creases was difficult. – This was easier after the first few, but in hindsight I would have used a lot more staples to get the tension more uniform. – I used a blade scraper and steel brush to remove the old adhesive from the slate so that I has a nice clean bed to attach the new cloth to. 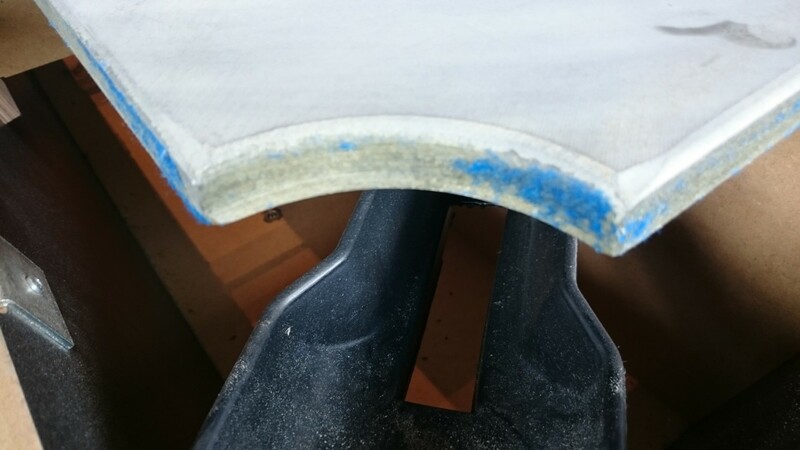 – I decided not to use the spray adhesive in the end because I read that contact adhesive was better to use, and to only use it on the edges of the slate so that there were no areas on top of the bed where the cloth would sit higher on the adhesive. – This adhesive worked pretty well and I had to make some wooden clamps to get the cloth to stretch evenly which I wedged tight with small pieces of wood while it dried. – Stretching the cloth around the pocket cutouts was pretty tricky too and it was a bit of a twitchy time cutting the cloth and trying to get them to fit – worked out well in the end. – To complete the table, I drew on the line and spot with a Sharpie pen and bolted it all back together. He has kindly agreed to provide a photographic record of the project… and here it is – part 2!!! This is continued from IQ Pool Table Recovering Project Part 1. Find out more about out recovering services at our sister site IQ Pool Table Recovers.